You may have pretended not to notice how your teenager’s eyes rolled when you pulled out the holiday decorations. You may have chosen to ignore their reluctance to participate in any family activity that isn’t directly related to them receiving presents. You may be struggling to remain happy and jolly when it seems as if your teenager would rather spend their time anywhere but with you and your family. While it is true that the holidays can be a trying time for teens and their parents, this doesn’t mean that you should throw in the towel and just try to get through the holiday season without any blowups. Sometimes, all you need is a little holiday magic to get everyone back on the same page, having fun and making memories together. Here are some great ways you can re-connect with your teenager this holiday season and ensure that everyone is feeling merry and bright. There are few things that will pull a reluctant teenager back into the family fold faster than a long cherished family tradition. These rituals are part of who you are as a family unit and provide the background of your shared experiences. Don’t skip over them because you think your teen has gotten too old to enjoy them. If they seem silly or too young, have your teenagers help find ways to update them and make them more relevant. This ensures you won’t lose the tradition or your teenagers enjoyment of it. As recalcitrant as your teenager might be, it will do them, and you, good to do something great for others. So much of the holiday season centers on gifts and presents and purchases that it is easy to get lost in that side of the holiday. Stepping outside of the shopping and partying to make someone else’s holiday bright can bring your family together and provide a soul-enriching experience for each of you. If there is one thing almost every teenager likes it is a competition so get them involved in making one. Enlist your neighbors and others in your neighborhood to have a holiday decorating contest. Have families donate prizes for the winners and then get to work making your holiday display the best on the block. There are always people in need this time of year and helping another family through a difficult time can not only help your family be more aware of the blessings you have, but also bring your closer together. Adopting a family can mean many things and may involve buying gifts, providing food, cooking dinner, or welcoming them into your home for the holiday. Find a local non-profit that helps families in need and find out how your family can get involved. 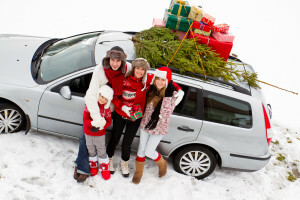 Doing things together over the holidays may be the last thing on your teenagers Christmas list but with a little thought and imagination, you can find ways to reconnect, re-engage, and reinvigorate your teen and your family as a whole this holiday season.